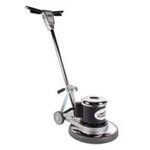 Our goal at FloorBuffers.com, is to bring our customers the highest quality floor buffing machinery and supplies at the most affordable price we can offer. Our experienced customer service personnel are anxious to assist you with your requirements or provide helpful information between the hours of 8:00 a.m. to 5:00 p.m. Monday thru Friday, CST. Our spacious warehouse, which is shown below, is stocked to the brim with all of your floor buffing maintenance needs. Most orders ship in 24 hours, and we try and ship every order complete, because we know missing the smallest thing can slow down your cleaning team. Our job is to make your job easier! We recognize that service of our floor buffers extends beyond the ordering stage. Our staff of cleaning experts will help you choose the right chemical, or piece of cleaning equipment as your requirements grow and your needs change. If you buy your floor maintenance equipment from FloorBuffers.com, our trained service technicians will be there to help, from the first day of operation and to guide you when changes are needed. Competitive Prices - When it comes to prices, we meet the challenge. Because of high volume buying, we offer maximum price breaks on all items regularly. Order Online - Order Securely online 24 hours a day, seven days a week, or contact us directly at 1-920-750-7304 locally, or 1-855-242-9027 toll free. At FloorBuffers.com we value customer engagement and involvement. We hope that our use of the following social media sites will provide multiple opportunities for our customers to learn more about and connect with us.